Strawberry Shortcake. Send the sweetest Congratulations with this Strawberry Shortcake. 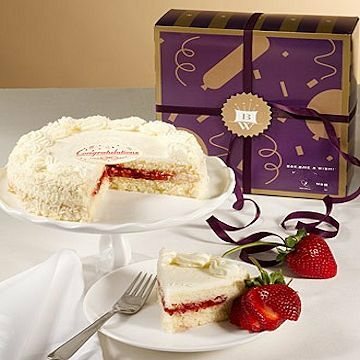 A favorite from coast to coast - two moist golden cake layers are brimming with luscious strawberry fillling, blanketed with pure whipped cream, garnished with white chocolate shaves all around the sides. This cake is topped off with a Belgian chocolate plaque inscribed with your occasion selection. Cake ships frozen.